Of all the things you never leave home without, your phone is usually somewhere near the top of that list, ready to whip out at a moments notice. You keep all your most vital information on it: birthdays, important meetings, reminders, beloved images, what have you—but all of this is worthless without the people behind each of these things. And Drops First Aid for iOS wants to make sure that your phone helps you keep them around too—or strangers, for that matter. Offers quick, easy to understand lessons (so you can breeze through if time is of the essence) that let you brush up on what exactly you need to do to keep others (and yourself) safe in nearly any kind of accident. In addition to explaining the steps in sequential order, there's also video instructions that come with each different accident type, so you know you're doing what you're supposed to. And there's even an option to directly call emergency services should the need arise. One of the great things about the app is that it's supposedly just as useable when you're using it casually to refresh your memory or when you're depending on it to potentially save someone's life. If you have more time to spend, you can watch the videos and take in more information, or you can hit the basic steps, checking your progress and making sure you're going in the correct order along the way. 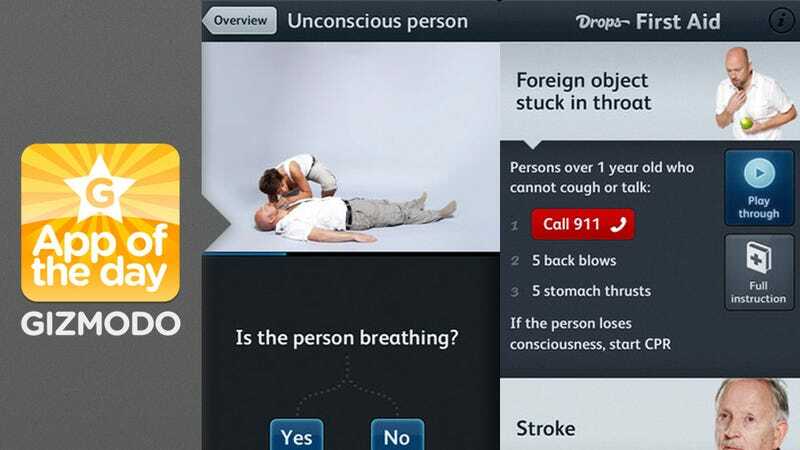 Plus, if you already have basic CPR training, there are additional courses to build on what you already know, making it equally usable for the advanced and beginning alike.